Although Poynton lies on the edge of the Pennines and many of the earlier farms etc. were built of stone, the development of coal mining led to the extensive use of brick throughout the area. Uses were many including houses, colliery buildings and shaft linings; agricultural improvement during the nineteenth century also led to heavy demand for other clay products in the form of drainage pipes and tiles. By 1840 brick and tile making had been concentrated close to Lower Park Farm 1 under the control of the estate agent. The 1841 census notes Job Shipton and William Shipton as brickmakers who lived close to here. 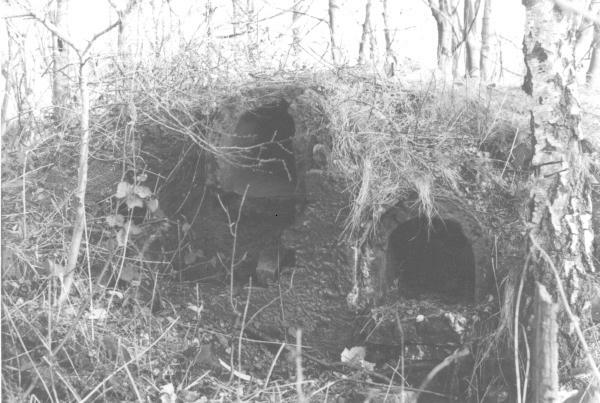 After 1845 the colliery reports refer to this kiln. The tenants were supplied with drainage tiles (or pipes) and the output was 68,000 for 1845, 177,880 in 1846, and 325,300 in 1847. Bricks were used extensively in the new housing and colliery development taking place at this time and these were probably also produced at Lower Park. In 1847 64 bricklayers, tile and brickmakers were employed by the colliery. The 1854/5 report states that �9 had been spent by the colliery on average over the last few years on drainage tiles for the tenants who cut and laid the drains at their own expense. By 1863 bricks were being sold by the colliery and in this year �9 15s 5d was owed for bricks and ironstone. Locally made bricks- Left; from brickworks by Robin Hood PH, High Lane. Right top and centre: Vernon Brick, Park Pit. Bottom: Colliery brickworks by station. 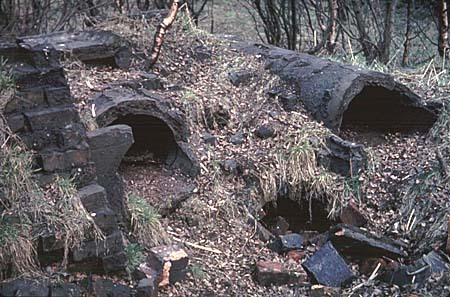 There were various types of coal-fired kiln in use and that at Lower Park was possibly a Scotch rectangular kiln. This was an updraught type with a compartment for the fire underneath, an earth bank on either side, the top open, one side openable for loading and unloading, and on the other access to the fire tunnels in a roofed over area. Woodforde describes in detail such an estate brickyard in Sussex, where the kiln could hold 17,000 to 20,000 bricks.2 Examples of local brick from this period can be seen in the almshouses near the church and Long Row on Park Lane. "Extensive brickworks have been erected near the railway junction just named They have been established mainly for the purpose of utilising the pit shales drawn in the course of coal work and also for the manufacture of ordinary bricks The works comprise a steam engine with a 16 inch cylinder, Boiler, Crushing and Grinding Machinery, pug mill and brick making machine (Morands). The machinery was made by Messrs. Easton and Tattersall of Leeds. It is now making good bricks but has been very troublesome chiefly owing to its parts not being sufficiently strong and to other defects in construction. These have apparently been remedied and I hope there will be no more drawbacks. The machine will by fair going make 2 million bricks, per annum, at a labour cost of 10s per thousand. A brick drying shed in which the drying is effected by the exhaust steam of the engine has also been put up: the application of the steam has been quite successful. A patent brick kiln (Pollock & Mitchell) with 8 chambers has also been built with a chimney 120 feet in height- This is not yet in full operation but the burning has been commenced: it will probably have to be burnt off a time or two before the bricks will be as hard as they ought to be. The 1871 1:2500 O.S. map indicates that a small scale brickworks with two rectangular kilns had already been working on this site but this new development was on a completely different scale. Invoice for bricks from colliery brickworks by station. This works settled down to producing bricks and tiles in fairly large numbers (see table). In 1877 bricks were used for the new gasworks adjacent and for alterations at Beechfield, Greenwell's house. Two years later a new machine for making drainage tiles or pipes was installed along with new dies for brick and pipe machines, and cast iron plates were laid on part of the drying shed floor. Production of drainage tiles was commenced due to low prices for bricks and little local building. In 1880 competition kept brick prices low but tiles sold well. By 1882 a decision was made to make pressed bricks and special bricks in order to improve sales; a new round kiln 16' wide similar to the kiln at Sudbury was also built at a cost of �. Soon after trade improved and many bricks were sold for a new mill at Stockport. New clay supplies were obtained by building a tunnel under the railway to a field on the west side where it was hoped that better quality material would be found. A tramway through this tunnel brought clay to the works and a donkey was used to pull the loaded tubs. This tunnel survives, being 62" wide with a semi-circular arch three brick courses thick. Unfortunately Greenwell reported in 1883 that the clay was not as good as he had hoped. 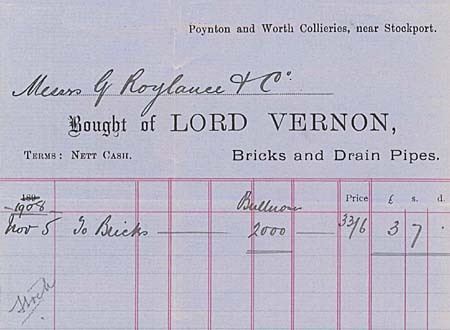 In that year production of 391,000 bricks and 313,200 tiles cost �2 in wages, �7 in coal, and � for materials, repair and maintenance.5 Large numbers of bricks were used in the new works at Park Pit and also for the new Poynton Station although hopes for orders during the widening of Stockport viaduct were dashed when the LNWR used its own bricks from Crewe and Staffordshire blue bricks for facing. Repairs were needed to the brick machine in 1886 and work was held up for two months in 1888 when a new pan and grinding wheels were required. The brickworks staff in 1887 was as follows: J. Rhodes, Manager, 42s per week. Two men 4s 6d per day. Eight men 3s 2d to 3s 6d per day. The brickworks continued on similar lines for some years but had closed by 1920 when it was offered for sale along with most of the Vernon Estate. The 1:10560 O.S.map of 1910 shows the main buildings the same as in 1897, but a third circular kiln had been added. By 1920 the kilns and railway siding remained but the building which housed the machinery had gone. Today the main site is a mixture of scrub, water filled pits and some foundations, whilst the clay field on the other side of the railway has been levelled and made into a park. At Park Pit brickmaking recommenced in 1937 after the closure of the collieries. A private company, the Poynton Brick Co. used shale from the colliery tip to make bricks using an open topped kiln of the Scotch type. In the 1939 Directory the works is described as run by the Vernon Brick Co., and soon after was taken over by J & A Jackson. 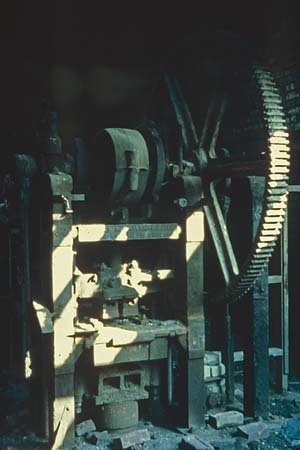 The machinery was situated in the old colliery power house and the bricks with "Vernon Poynton" on the face could still be found in the press until the works was demolished in the early 1970s. The plant was electrified in 1956 and the kiln had a top put over it, but production ceased in 1958. Maximum output was 65,000 bricks per week. Brick kilns at Park Pit. Former power house can be seen over kilns at left centre. 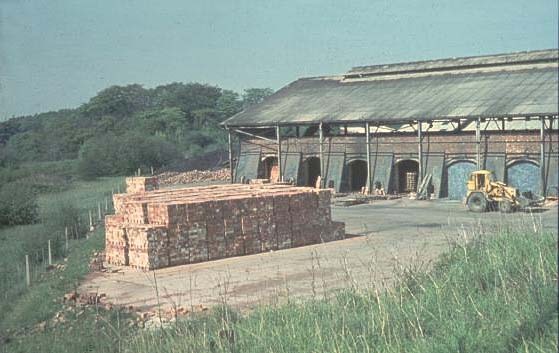 The other brickworks in Poynton was that of the Poynton Brick Company situated north east of Pool House Road, which was established in 1924 by a group of local tradesmen. A Mr. Tomkinson was brought in as manager from claypits nearby. Success was elusive and in 1929 J. & A. Jackson of Adswood took over and reopened the works from 1934 to 1938. 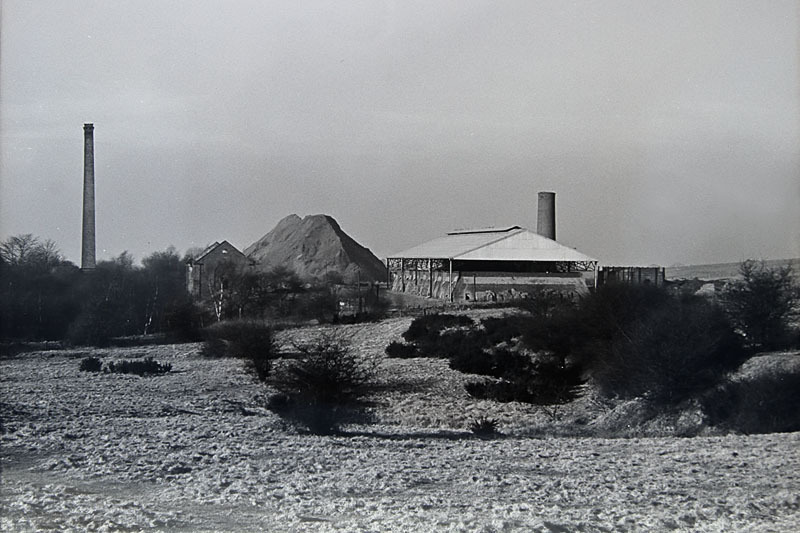 Increasing demand led to reopening from 1947-53 and then the works was modernised with mechanical handling methods in 1958, when it could make 160,000 bricks a week using shale imported from Bredbury, Pott Shrigley and Kerridge. In 1974 Christian Salvesen took over the firm which was then making up to 180,000 bricks a week. The works was closed in October 1979, when production was transferred to Denton, and has now been demolished. Bricks made at the brickworks near the station can be seen in many places including the old locomotive shed at Hockley, terraced houses dated 1891 and 1892 in Park Lane and London Road South and the Lady Pit winding engine house. 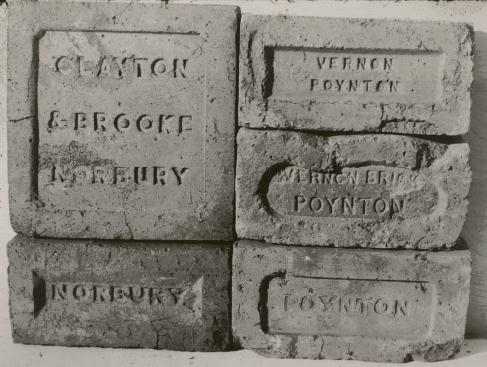 Vernon bricks are numerous and examples can be picked up at Park Pit amongst the rubble. Gas production is an activity closely associated with coal mining, and it is not surprising that a gasworks was established by the collieries during the second quarter of the nineteenth century. The first gas works in Poynton appears in the 1849 survey and map. It was situated on the north side of the colliery railway close to the level crossing on London Road. A short siding had been installed to bring in coal and remove waste and by-products. Although Ashworth makes no mention of this works in the colliery reports at this time, it is probable that it was established at the time that the railway was built in 1845 when coal could easily be transported to it. The 1871 1:2500 O.S. map shows a small range of buildings and one gasometer with possibly a chimney close by. "The Gas Works require considerable extensions and it has been considered desirable to move them away to the junction between the Poynton private railway and the London and North Western Railway. The pipes for this purpose have been ordered 6 inches in diameter and about ¾ths of the quantity have been delivered. In 1876 gas fittings were installed in the schools at Poynton Green whilst a year earlier the Baptist Church in Park Lane was fitted with gas heating at a cost of �0. 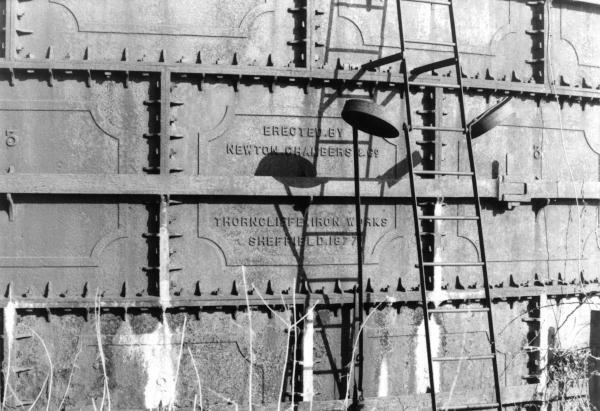 The gasholder supplied in 1877, now at Hilltop Farm, 1982. Expenditure on the new gas works totalled �05 by the end of 1878. The plant was supplied by Newton Chambers & Go. of Thorncliffe Iron Works Sheffield and engineers Easton and Anderson appear to have supervised the work. It was not until 1877 that the new works went into production and during the next year or two the emphasis was on laying more pipes. Some pipes came from Stockport Gas Works and may have been second hand. During 1879 gas to the value of �4 was supplied but the cost of production was �8. New retorts were installed during the year and it was hoped to increase consumption as soon as possible. Further mains were to be laid at the same time as the new water pipes and by offering a reduced price to cottagers it was hoped that economies of scale could be achieved. A note in the Stockport Advertiser expressed customers' dissatisfaction with the current price of 5s per 1000 cu. ft. and 1s per quarter meter rent. Many villagers were said to be unable to afford gas. The problem was and continued to be that the gas works was capable of producing a large amount of gas, but low demand kept prices high whilst high prices kept demand low. When the new station was built the LNWR was only charged 3s 6d per 1000 cu. ft. to light the station and coal yard but it was not until 1891 that the general price fell to 4s. Consumption immediately rose by 10½% and in 1892 topped 2,000,000 cu. ft. reaching almost 3,000,000 by 1897. By 1893 the church was using gas and in 1897 the new shirt factory of E.R. Buck was also supplied with gas at a special rate of 3s 3d per 1000 cu. ft. and would probably be a large consumer. Although detailed accounts are not available after 1897 the steady increase of gas usage must have been maintained. The first street lighting in Poynton was the 1897 Jubilee Fountain and Lamp Standard and over the next thirty years further lighting was slowly installed. Profits for l9l4-19 averaged �7 per annum which was considerably better than in earlier years. 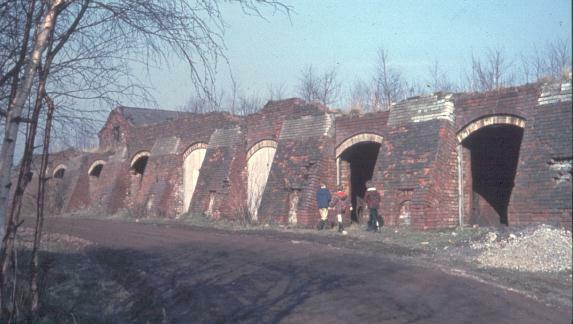 Derelict retorts at gasworks 1964. "THE POYNTON GAS WORKS situated adjoining the Poynton Station (L & N. W.R.) and embracing an area of about la. 1r. 21p. THE PROPERTY comprises: The Brick-built and slated Meter House fitted with Meter for recording the making output, by the Gas Meter Company, Oldham; two sets of Purifiers and Lime Store, adjoining Iron Gas Scrubber. Brick and Slated Engine House containing Andrew's Stockport Gas Engine and Exhauster. Retort House also Brick built and Slated, containing four sets of five Retorts, Cistern and Hydraulic Gas Mains, leading to a Set of 15 Coolers; at side Brick and Slated Office. Adjoining the Retort House is a Large Open Goal Store with Corrugated Roof, Vertical Steam Boiler, Brick and Slated Governor House fitted with Parkinson's Station Governor; there are two Gasometers estimated to be capable of holding 60,000 and 40,000 cubic feet of Gas respectively. A Railway Siding is taken off the Colliery Railway, which in turn connects with the L. & N.W.R. Railway's System. The works was withdrawn before the sale took place presumably because the new Poynton Collieries Company decided to run them as an associated enterprise. In 1921 the valuation list gives a value of �8 per annum for the works, gasholders and mains. When the collieries closed in 1935 the gas works was sold to the Stockport municipal authority and in October 1935 Stockport gas was connected to the mains for all Poynton users. On the day of the change the remaining gas in the Poynton gasholders was allowed to escape into the air and the works closed down. The only difference for the 1200 or more consumers was a slight increase in pressure and a substantial reduction in price from 6s 5d per 1000 cu. ft. to 3s 6d with a special rate of 1s 6d for industrial use and central heating. Some remains can still be seen on the site of the gasworks including derelict retorts, a gas holder pit and the perimeter wall. The first gasholder was removed to a site near Hilltop Farm (SJ 950832) where it was fitted with a new concrete top and used as a water tower. Although no longer used it still stands and the cast iron makers' plates of 1877 are a fitting memorial to the Poynton Gasworks. 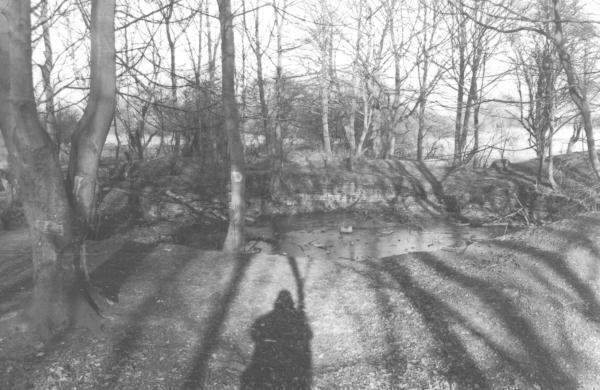 The base of the gasholder can still be found at the back of Poynton Station, 1982. 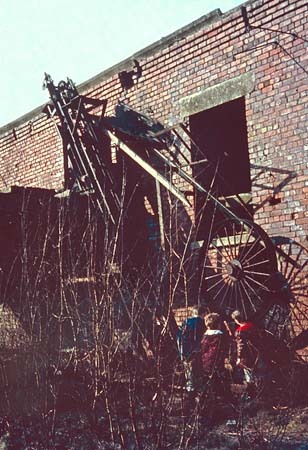 Derelict retorts remain at the gasworks site, 1982. 2. Woodforde, J. Bricks to build a house, Routledge & Kegan Paul, 1976. 4. Report on present position and future prospects of Poynton Colliery, 1875. DVE. Acc 1893/3 CRO. 5. Colliery Report 1882. DVE. Acc 1893/2 CRO. 6. List of colliery employees, 1887. DVE. Acc 1893/6 CRO. 7. Colliery Report, 1897. DVE. Acc 1893/2 CRO. 8. 1875 Report on colliery prospects, op. cit. 9. Colliery Report, 1886. DVE. Acc 1893/2 CRO. 10. Poynton Estate Sale Catalogue, 1920.